The Kozmo.com brand may be re-birthed a decade later. Remember Kozmo.com, the dot.com bubble service that would deliver a pack of gum to you at no charge? The company raised about $250 million, tried to go public, and then went belly up. It looks like the Kozmo.com brand may be coming back, and it’s happening under some rather unusual circumstances. Yummy Foods, LLC runs Yummy.com, a grocery delivery service in Los Angeles. Last year it was granted two U.S. trademark registrations for the term “Kozmo”, which it intends to use for its delivery service. 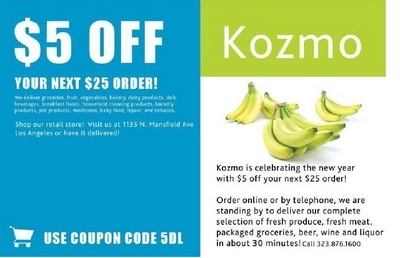 Still not convinced Yummy wants to rebirth the Kozmo.com brand for food delivery? It just filed a domain name dispute with World Intellectual Property Organization to get the domain name Kozmo.com. Kozmo.com currently doesn’t resolve. Its whois record still contains the company’s old (disconnected) phone number and address. The Network Solutions whois record shows an expiration date of April 2011 but the registry expiration date is in April 2013. It’s unlikely that anyone will respond to the domain dispute because the contact information for the domain is no longer valid. Still, this domain technically can’t be won through a UDRP by the letter of the rules. It would be impossible to show that the domain name was registered in bad faith. It was registered and used in good faith for a business model that didn’t work. Of course, the complaint could omit that key detail and the panelist might not recall the history of the domain. I’ve reached out to the lawyer on the trademark filings as well as Yummy.com’s press email contact for comment. Before L.A. residents get their hopes up, you won’t be ordering packs of gum with no delivery charge. Yummy.com currently has free delivery only for orders over $100.